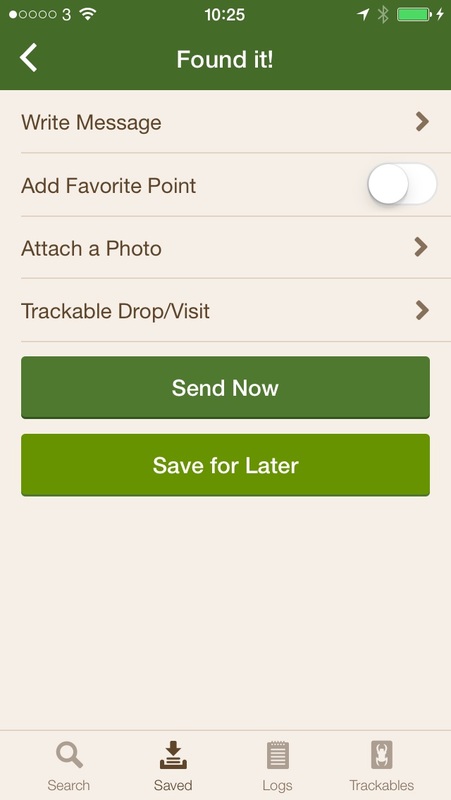 HomeAppsGeocaching Premium App – Is it worth the money? The Geocaching Premium App is not a cheap app. So is it worth spending the money? We have a look and compare it with some free alternatives. If you’ve not come across Geocaching before, you’re missing out on a great trick with getting kids out for a walk. 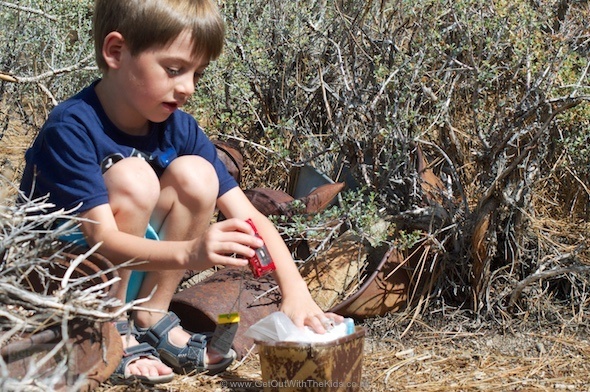 If you’re not sure what Geocaching is, read our getting started guide. We’ve tried many Geocaching apps, with some success with the free Geobucket and c:Geo on Android. There is, of course, the official free Geocaching Intro from Geocaching.com, but it wasn’t long after getting that we decided to upgrade to the Geocaching Premium App. As apps go, the Geocaching Premium App is on the more expensive side. At the time of writing it was £6.99. So is it worth it? With the free Geocaching Intro app, you can log into your Geocaching.com account and query for nearby caches, and navigate to them. So why would you want to upgrade? The big selling point of the paid app for us was the ability to save caches to the phone and work with it offline.  Many places we walk don’t have a good mobile signal, and so this feature is vital. 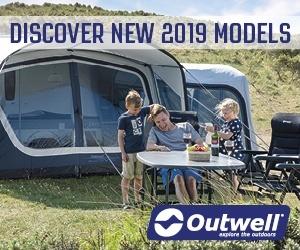 The ability to find caches when connected to Wifi and then use them offline later also saves on any data charges you may have on your phone. Finding caches with the app is straightforward. If you do have a mobile connection when you are out, a ‘Find nearby caches’ on the app’s home screen allows for some impromptu geocaching when out and about. It’s also possible to save caches and make groups of favourites to find later. Very handy when planning ahead. Even saved caches have their description, and even the hint is easy to see without having to decrypt. This is, of course, the main purpose of the app, and I’m pleased to say it’s simple and works well. The navigation mode works in either compass or map view. 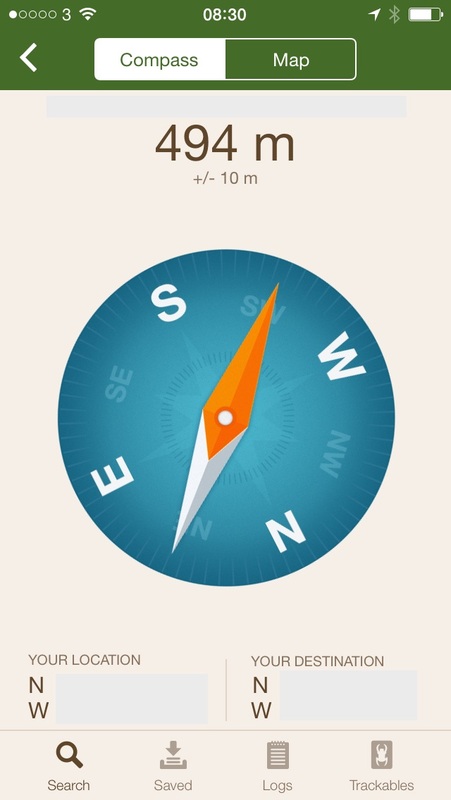 Compass is simple: just follow the orange arrow that points to the hidden geocache. The screen also clearly shows you how far away from the cache you are. The other mode is tracing your route to the cache on the map view. When there’s a data connection I find it really useful sometimes to use use the satellite map, especially when out in the hills. The only wish I’d have for this app would be to have the option to display UK Ordnance Survey maps. The maps it uses on the iPhone are Apple Maps (street, hybrid, and satellite), Open Street Map, and Open Cycle Map. Another thing you can do with this app is log when you’ve found a cache. You can save a log for later and sync when you are back on Wifi, or you can send there and then if you have a connection. If there are trackables in the cache, or you are dropping one off or just visiting the cache, you can record that too. We found one slight issue here though. It appears to need a data collection to look up what trackables you have in your inventory, and this can make filling out the log screen a bit slow. If you want to take pictures and send them with your log you can do that too. The only real issue we found was with logging a trackable (apart from the speed of logging trackables, mentioned above). To be fair, I think it’s a general issue with Geocaching.com, and not specific to this app. We were lucky enough to visit the Sierra Mountains in California. We’d taken a trackable across the Atlantic and dropped it off in a beautiful location. As expected though, we had no data connection. So we logged the visit and trackable drop-off and saved it for syncing later. 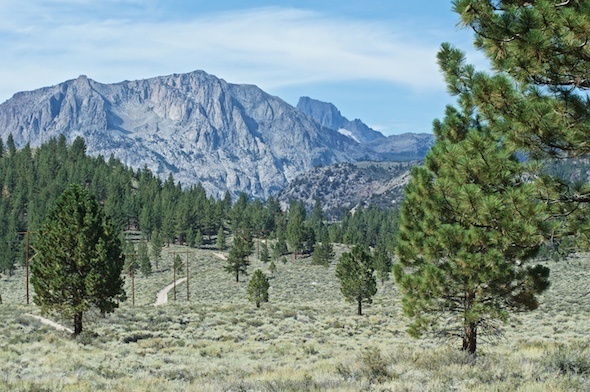 While exploring the Sierras and Yosemite, syncing geocache logs wasn’t a priority. By the time we did a sync, someone had picked up the trackable from the cache. Geocaching.com would not allow us to sync our log, as the trackable was now with someone else. I found no way of logging it online at Geocaching.com either. So it never recorded us dropping off this trackable in the beautiful location after putting thousands of miles on the trackable. This was a double blow to us, as our geocache visits were also plotting our adventure across the west coast of the USA. For a long time, we had been using c:Geo on a Samsung Galaxy. This was working OK….but which is better: the free c:Geo or the paid Geocaching App on the iPhone? Well, perhaps it’s a little unfair to compare them directly, as the hardware in the Samsung Galaxy II is older than the iPhone 5s, so that may give the Geocaching App an advantage. So the last one in the list above, Accuracy, probably has more to do with Samsung Galaxy II vs iPhone 5s, and Android vs iOS. I had been finding that c:Geo on the Samsung wouldn’t always find the GPS signal, and sometimes when you got close to a geocache, it wound then vary +/- 50m, which is not very helpful. The accuracy with the iPhone/Geocaching app has been a lot better. It finds the GPS quickly, and gets us quite close to the Geocache, usually +/- 2m accuracy. So is the Geocaching Premium app worth it? As you can see, you can get free apps that have the same functionality, and the Geocaching Premium app hasn’t been perfect. However, I don’t regret buying it. It has worked well on the iPhone, and accuracy has been the best phone based GPS/Geocaching combination we’ve tried to date. So if you don’t mind parting with £6.99 for something that more-or-less “just works”, and Geocaching is something you do a lot, then getting the Premium App is worth it. 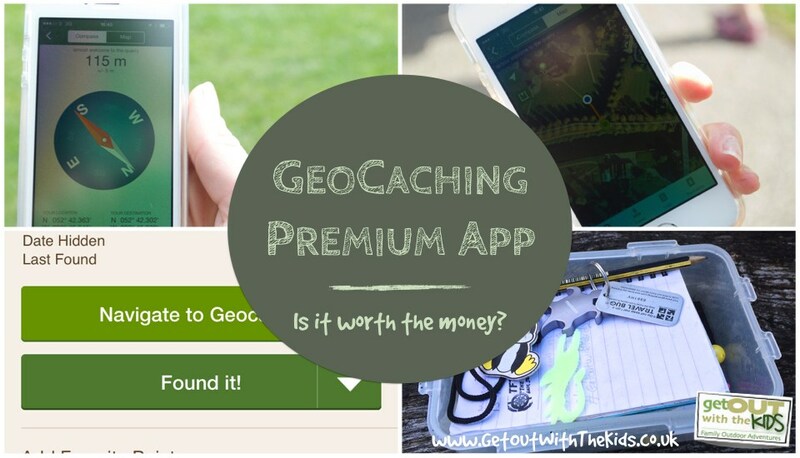 2 reviews for Geocaching Premium App – Is it worth the money? Interesting… I have c:geo on my galaxy S3 and noticed the GPS is off by up to 5 metres, but don’t mind as we are supposed to search, right? Not sure I would spring for a paid app as I can save caches on my S3, but nice to know what you get for the $.